The best place to obtain the most up-to-date information about the Shaky Tour and the assorted shows of Thayer Sarrano is, without a doubt, via her own Concert Ledger, found within her broader website. You might also consider the Event Calendar of her Facebook Band Page. Thayer Sarrano is a musician of the first order, a gifted singer-songwriter and multi-instrumentalist. 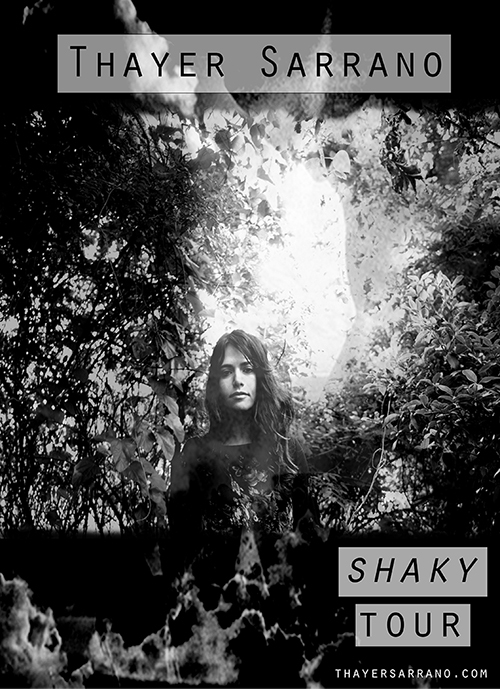 Whether she accompanies herself solo with a guitar (electric, acoustic) or at the piano, whether she performs with her trio, or some distortion-laden variation of her larger ensemble, each setting situates her songwriting skills in a different hue, offering fresh shades, perspectives, and nuances to songs you might have thought you had pegged. 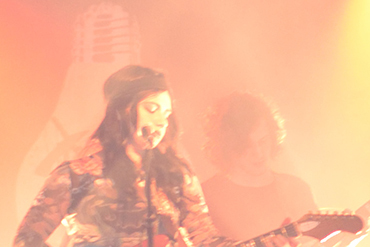 The Shaky Tour officially began with the album's release in late August 2015. In conjunction, Thayer Sarrano performed at Pappy and Harriet's in Pioneertown, California. Her set there was part of the broader Camp Out Festival. This annual gathering features Camper Van Beethoven and Cracker as fixtures amongst a steady rotation of other musical acts. The Guildwater Group would like to thank David Lowery, Johnny Hickman, and all the Cracker and Camper camp, for providing such an auspicious platform for the Shaky launch. More locally, in September, the official Shaky album release show unfurled at the historic Seney-Stovall Chapel in Athens, Georgia. The Seney-Stovall proceedings began with performances by Etienne de Rocher, as well as the Athens Cowboy Choir. 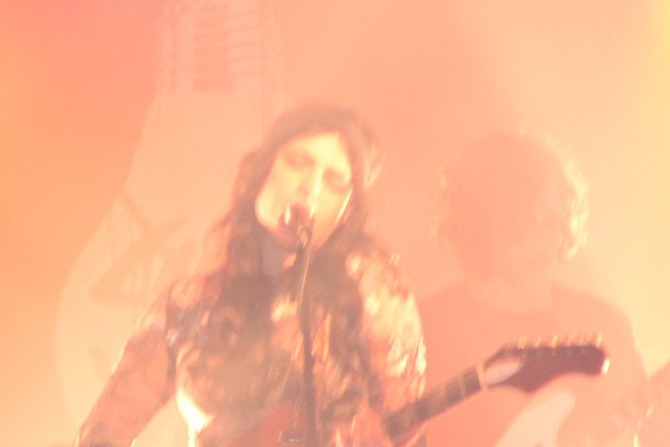 Thayer Sarrano then took the stage, playing most all of the songs from her new album. Her ensemble of that evening included: William T. Kissane (drums), Bubba McDonald (bass), Dan Nettles (guitar), and John Watkins (keys). For the show's finale, the Athens Cowboy Choir joined Thayer's ensemble for "Hide My Health." Sound was crafted by Colm O'Reilly. The lights and stage sets were orchestrated by Jason Huffer of Third Phase, working in conjunction with Thayer Sarrano herself. Georgia State Television (GSTV) of Georgia State University filmed and recorded the events of the evening. The first of several songs from this show are available on Thayer Sarrano's YouTube Channel. More are on the way. 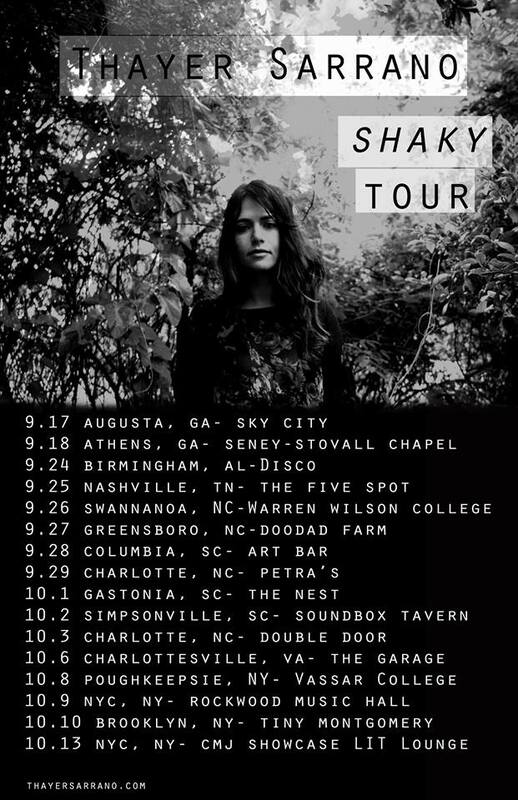 From the Seney-Stovall Chapel, Thayer Sarrano launched across September 2015 into the first iteration of her East Coast Tour -- Version 1.0 -- with the band making stops in Birmingham, Nashville, Columbia, Charlotte, Greensboro, Washington, and Brooklyn, among still other locales. When the Thayer Sarrano Trio performed at the broader annual musical showcase hosted by CMJ in New York City, this leg of the Shaky Tour was given fitting climax. All told, if one includes several preliminary performances, not indicated on the poster above, such as the show at the Cox Capitol Theatre in Macon, Georgia on August 20th, Thayer Sarrano's ensemble featured a wealth of different musicians: Seth Hendershot (drums), William T. Kissane (drums), Bubba McDonald (bass), Zack Milster (bass), Dan Nettles (guitar), Thayer Sarrano (vox, keys, guitar), and John Watkins (keys). (We believe that is everyone.) Together they played, by our count, 17 different performances in seven different states. They trekked 3,672 miles. They drove a grand total of 59 hours and 52 minutes, by low estimates, assuming no traffic or toll booths. Accompanying Thayer most often, however, on this tour leg were William T. Kissane on drums, and Zack Milster on bass. 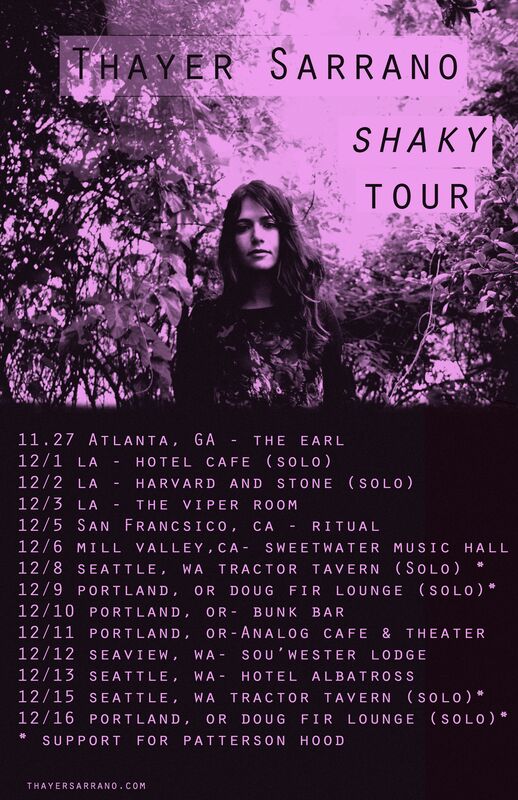 Across November and December 2015, Thayer Sarrano unveiled her West Coast Tour, offering performances in Los Angeles (three separate shows, including the Viper Room), San Francisco, Mill Valley, Portland, and Seattle. Patterson Hood of the Drive-By-Truckers made this leg of the Shaky Tour possible, inviting Thayer to open four of his solo shows in Oregon and Washington. For this excursion up the West Coast, Thayer Sarrano was accompanied by Zack Milster on bass, and, depending on the venue, by either Ted Kuhn or C.K. Koch on drums. For the shows in Portland and Seattle, Thayer herself played keys on certain songs for Patterson Hood's set, who was himself also accompanied by Chris Funk of the Decembrists. 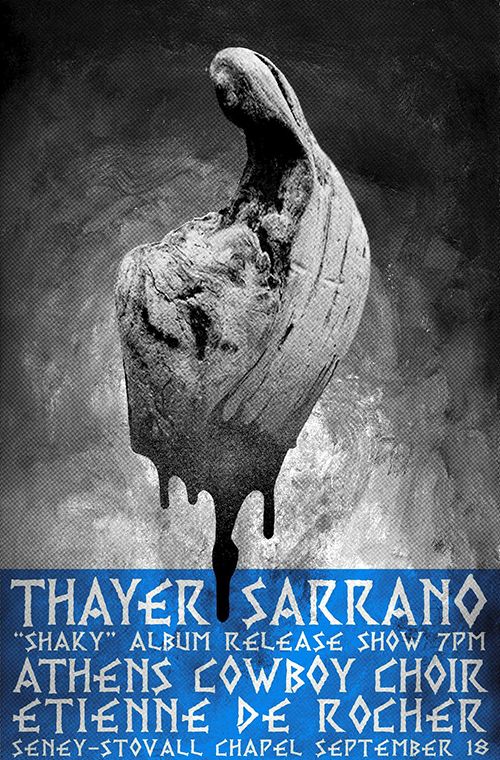 With West Coast 1.0, late last November and December, Thayer Sarrano gave 14 performances in four different states. Thayer and her squires logged 2,121 miles on the road, and another 4,766 miles in the air. They drove by low estimates for 35 hours and 4 minutes. They flew for a low estimate of 10 hours and 25 minutes. 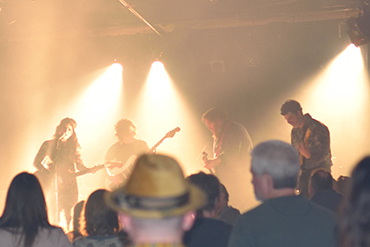 The success of Thayer Sarrano's performances in tour support of Patterson Hood across December 2015 on the West Coast, prompted the frontman of the Drive-By Truckers (Mr. Hood himself, of course) to invite her to perform for a series of shows in 2016. This prompted Version 2.0 of an East Coast Tour for the album Shaky across late February and March. The Guildwater Group would like to thank all the Truckers for making such an opportunity possible. 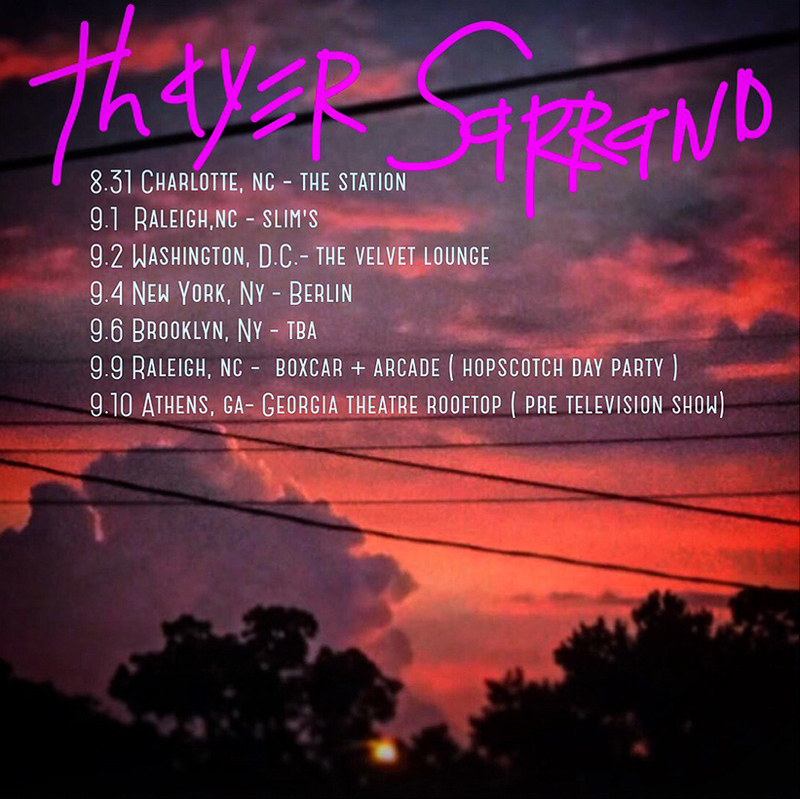 Please stay tuned to Thayer Sarrano's own Concert Ledger for any additions and / or changes of date or venue. Joining Thayer on this leg will be JoJo Glidewell (keys), William T. Kissane (drums), Zack Milster (bass), and a newly-acquired Hammond XK-2. Among other destinations, the band performed in Nashville, Charlotte, Washington, Brooklyn, Cincinnati, and Charlottesville. 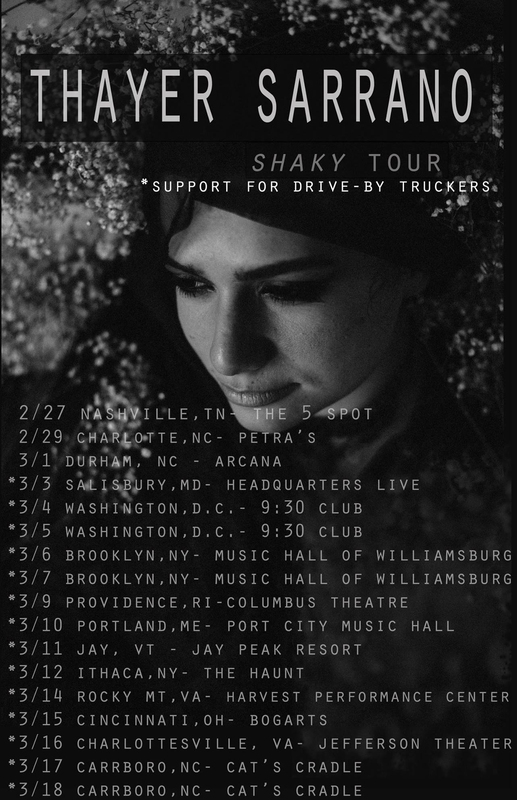 For this leg of the Shaky Tour, adding in their performance at the Flicker Theater in Athens on February 26th (not notated on the poster above), Thayer Sarrano and her band gave 18 different performances, in 12 different states. They logged 4,278 miles on the road. They spent (by low estimates) 72 hours and 17 minutes behind the wheel. This amounts to 3 whole days of straight driving. All told, when you add these first three Shaky Tour legs together, the numbers stagger. The grand total traveled stands at 10,071 miles on the road, or 14,837 miles when combined with the air. A low estimate of 177 hours and 38 minutes were spent in transit, which is around 7.5 days, or an entire week of non-stop travel -- all this if our calculators and skills of arithmetic do not deceive us, which is quite possible. We Guildwater Scriveners lifted this photograph from the website of Thayer Sarrano, and so should you. Admittedly, we humble scribes were a little spoiled by the scale and scope of the previous East Coast Tours undertaken by Thayer Sarrano. As a result of those prior excursions, Thayer's recent run up this same coast was a more modest affair, at least in terms of its duration, but not really in terms of the miles traveled, and certainly not as concerns the importance of the venues themselves, to each of which we extend thanks. Hence, we have dubbed, not at all dismissively, this completed run as East Coast 2.5 (2016). If you include the very last of her four shows at The 5 Spot, constituting part of her August Residency, in Nashville, Tennessee, on August 25th, as well as her appearance at the Wildwood Revival just outside Athens, on August 28th, neither of which are depicted on the poster above, Thayer Sarrano played, across a mere two weeks, a total of 9 shows in 5 different states. On this particular leg, some 2,388 miles were traveled. And some 33 hours and 26 minutes were spent behind the wheel, that is, barring traffic, and gliding gracefully over that lovely row of toll booths along the New Jersey Turnpike. These fresh numbers add further to the totals traveled in the name of this album -- Shaky. Here are the said totals: 12,459 miles on the road, or 17,225 miles when combined with the travails of air travel. This makes for a grand sum of 211 hours and 4 minutes spent in transit alone, on all tours, including Thayer's West Coast 1.0 (2015). This amounts to 8 days and 23 hours of perpetual motion. Accompanying Thayer at different junctures on this tour, including the last show at The 5 Spot, as well as the Wildwood Revival appearance, were the following musicians, listed in alphabetical order: William T. Kissane (drums), Edward "Ted" J. Kuhn, Master of Fine Arts (bass), Rick Lollar (baritone guitar), Zack Milster (bass), Jason Nazary (drums), and Marlon Patton (drums). Kuhn and Nazary accompanied Thayer on all the shows depicted in the poster above. Lollar and Patton jumped in at The 5 Spot. Kissane and Milster went wild at the Revival.